This episode is on a topic that I find fascinating – the cultural issues that underlie our parenting. I actually think this issue is so important that I covered it in episode 1 of the podcast, which was really the first episode after the introductory one where I gave some information on what the show was going to be about. But recently I read a book called Generation Me (Affiliate link) by Jean Twenge, a Professor of Psychology at San Diego State University, which discusses some of the cultural contexts that have led to the generation of people born since 1970 to develop a certain set of characteristics that sometimes seem very strange to those who were born before us, and may be leading us to raise children who are just a bit too individualistic. In this episode I discuss some of those characteristics and what implications they have for the way we parent our own children, and offer some thoughts on how we can shift that our approach if we decide we want to. Abeles, V., & Rubenstein, G. (2015). Beyond measure: Rescuing an overscheduled, overtested, underestimated generation. New York: Simon & Schuster. McCabe, D.L., Trevino, L.K., & Butterfield, K.D. (2012). Cheating in college: Why students do it and what educators can do about it. Baltimore, MD: Johns Hopkins University Press. Remley, A. (1998, October). From obedience to independence. Psychology Today, 56-59. Trinkaus, J. (1988). Compliance with a school zone speed limit: Another look. Perceptual and motor skills 87, 673-674. Trinkaus, J. (1997). Stop sign compliance: A final look. Perceptual and Motor Skills 85, 217-218. Trinkaus, J. (2006). Honesty when lighting votive candles in church: Another look. Psychological Reports 99, 494-495. Hello and welcome to the Your Parenting Mojo podcast. We have an episode coming up today on a topic that I find fascinating – the cultural issues that underlie our parenting. I actually think this issue is so important that I covered it in episode 2 of the podcast, which was really the first episode after the introductory one where I gave some information on what the show was going to be about. But recently I read a book called Generation Me by Jean Twenge, a Professor of Psychology at San Diego State University, which discusses some of the cultural contexts that have led to the generation of people born since 1970 to develop a certain set of characteristics that sometimes seem very strange to those who were born before us. Today I want to discuss some of those characteristics and what implications they have for the way we parent our own children. I should be clear that as Dr. Twenge defines it I am a member of Generation Me – she says Generation Me starts in 1970 and I was born in 1979. I do think that some of the characteristics she defines as being integral to Generation Me apply to me, but I also think that these have become stronger over time and so are more pronounced in people who are younger than me. I should also remind you (in case it isn’t obvious from my rather strange accent) that I was raised in England and not the U.S.. I think that the Generation Me characteristics apply to some extent to people who weren’t raised in the U.S. but they are based on surveys of Americans so Americans are definitely at the core of the Generation Me characteristics. Dr. Twenge doesn’t discuss non-American countries but we can probably assume that English-speaking, Westernized countries exhibit these characteristics to a slightly lesser degree, with “non-Westernized” cultures perhaps looking a bit different, depending on the extent to which American culture has permeated them. I also want to use this episode to poke a little bit at some of the decisions I’ve made as a parent, and think through whether the ways in which I parent are in line with the goals I have for parenting, because reading the book made me realize that I need to be a little more conscious in this regard. So what really characterizes Generation Me? Firstly, members of Generation Me feel as though they don’t need anyone else’s approval. People used to wear uncomfortable suits to many workplaces simply because it was expected – and because a person aimed to ‘fit in’ with the expected social norms. People dress up to make a good impression on others and to seek approval, but members of Generation Me don’t feel required to seek anyone’s approval – about half of the members of the Northwestern University women’s lacrosse team wore flip flops with their quote demure skirts and dresses for their 2005 meeting with President George W. Bush at the White House. One of the student’s mothers, though, was quoted by the Associated Press as saying “Don’t even ask me about the flip-flops – it mortified me” – a clear example of the difference in standards across generations. Adults who wanted to get divorced 50 years ago would have worried about what others would think of their decision and they would have been ostracized, and in some cultures today that is still the case – but today a couple will divorce if they think it’s the right thing to do – and it’s not that they do this in the face of society’s disapproval; it’s that society in general doesn’t really have an opinion on the issue. One aspect of this lack of concern for societal approval that concerns me is the lack of manners I notice in children and young people, and I know I sound like an old fuddy duddy when I say this, but it really does get to me. And I’m not just talking about saying “please” when you ask someone to do something or “thank you” when someone holds the door open for you, but a general concern for other people’s comfort and even safety. Perhaps this is most obvious when we’re driving; it isn’t just in New York any more that the person behind you will honk if you wait more than a second after a red light changes to green, and speeding up the inside lane and then cutting off someone passing a truck is now commonplace on the freeways where I live. One researcher by the name of John Trinkaus found that 92% of cars observed going through a school zone in 1998 were speeding, with the highest percentage speeding in the morning when children were likely to be walking to school than in the evening, when they had probably gone home for the day. 89% of drivers sped through the same school zone when it was surveyed three years earlier, so I wonder if that number is now up to 100% given that two decades have passed since it rose to 92%. The same researcher found that in 1979, 37% of cars made a full stop and 34% made a rolling stop at a certain stop sign in a suburb in a New York suburb, but by 1996 only 1% of cars came to a full stop, 2% made a rolling stop, and the other 97% didn’t stop at all. Now when I first read these statistics in Dr. Twenge’s book I felt kind of indignant and that not stopping at an intersection was pretty irresponsible. But when I went and found the paper for myself I saw that the stop signs had been put up to discourage the flow of through traffic on local streets the one that was surveyed wasn’t at an intersection at all (and Dr. Twenge never tells us it is, but she doesn’t tell us it isn’t either) – so they’re the kind where if you look all around but don’t stop, the chances of getting into an accident are essentially nil. And then I realized that those are exactly the kinds of stop signs I routinely roll through myself after first slowing down and making sure I’m not going to hit anyone or anything. We cheat more often now as well, even when you might least expect it – in 1998, about 90% of church-goers who lit a votive candle paid for it; by 2005, only 26% paid, so 74% of people who are religious feel it’s fine to cheat the church! Cheating is also on the rise in high schools and colleges, and students in the late 1990s just seemed resigned to it when they were surveyed; three times as many high school students in 1969 said they would report someone they saw cheating compared to 1989. This was somewhat recent data when Dr. Twenge’s book was written in 2006 and data published since then indicates that the rate of cheating may have fallen more recently, although that’s probably due to an increase in the use of tools to detect cheating rather than a change in the overall view of whether cheating is right or wrong. And it’s not like people stop cheating as soon as they get out of college; Dr. Twenge cites the Enron scandal as a prime example of people going to work for a corporation that cheated other people, but even more recent is the effort of staff at Wells Fargo bank to boost their sales numbers by opening accounts in people’s names that they didn’t ask for. Some people at Wells Fargo knew it was wrong and spoke up or tried to speak up, but plenty of others went along with it or encouraged it, apparently including the CEO. And even where no legal wrongdoing occurs, corporations now essentially seem to see employees as a disposable resource rather than as a person worthy of respect. I’m always shocked when I hear examples of companies treating employees like crap because, really, companies are made up of employees – none of whom likes to be treated like crap, and yet different standards seem to apply as long as it isn’t *us* that is getting treated like crap. And I don’t fully excuse myself here – my day job is to work for a large consulting company trying to reduce our client’s environmental impacts, but there are branches of my company that outsource American’s jobs to India and make the American employees train the new Indian ones as a condition of getting severance pay. I find the indignity of that absolutely astounding, and yet I still work for the company because it helps to pay my mortgage and take care of my family and I believe I do good work myself. And it’s not just large-scale cheating that’s on the rise, it’s the little everyday things that niggle me – when you travel reasonably often for work it doesn’t take long to see this in action. People cut in front of you in line to get onto a plane earlier when the plane won’t leave until everyone is on it. And in the crush to get off the plane at the other end people will squeeze by someone struggling to get a bag out of the overhead bin in the rush to get off ten seconds earlier instead of helping the person to get the bag down. People wander, shouting, down hotel hallways in the middle of the night and slam doors as if nobody else on the floor was sleeping. I’ve actually been thinking about this issue for a while now, and wondering what kind of decisions we make as parents lead children to grow up with this sense of their own importance. As I searched around for answers I would keep coming back to Japan, because I have the impression that Japan has a very much more interdependent culture than the U.S. at the moment, where people do still have manners and more value is placed on the ability of a society to succeed than of any one individual to succeed more than everyone else. When I met a Japanese parent at a gathering recently she said that my impression was pretty accurate, but that Japanese society achieves this interdependence by not allowing anyone to stick out and be different, and that if anyone does stick out they are hammered down until they don’t stick out any more. And as I was reading Generation: Me, I also realized that it’s not just Japan who has this interdependent society – the U.S. had it as well until about the 1950s, when things started to shift, although perhaps to a slightly lesser extent than Japan had it as succeeding on one’s own does seem to have been a valued trait here since the Protestants came over from jolly old England, at least. Second on Dr. Twenge’s list of things contributing to the characteristics of Generation: Me is that children today are told they can do their own thing, whatever that thing is, and not care what everyone else does. In a psychology experiment that was first conducted in 1951, a psychologist called Solomon Asch asked seven people sitting in a room to identify which of three lines of different lengths drawn on a chalk board are the same length as a fourth line. One of the first three possibilities is the same length as the fourth line; the other two are clearly not the same. The six people who go first are called confederates, which means they’re in on the experiment, and they all say the much longer line is the same length as that fourth line. What would you do if you were the seventh person to answer the question? In 1951, 74% of people sitting in that seventh seat would go along with the group and say that the long line is the same length as the fourth line on at least one trial, and 28% of people would go along with the group on the majority of trials – the researchers explained that the social nature of humans and our need to conform overrode our need to be individual, or even just to be right. When researchers replicated the experiment in 1980, the results were completely different, and far fewer people were willing to conform to what the group thought. Solomon Asch, who designed the experiment, thought that the willingness to go along with others was an immutable indicator of our nature as a social species, but it turned out that the need to go along with what other people thought was a child of its time – and today’s children have been taught that they don’t need to do this. And the third important characteristic of Generation Me-ers is that children today are told they can be anything they want to be. American children today are taught from birth that being different is good – that the obedience, loyalty to church, and good manners that were so important back in the 1920s are now essentially irrelevant, replaced by a much higher value placed on independence and being open-minded. This individuality is celebrated from before they are even born, as we decorate expensive nurseries with decorations that spell out the child’s name in 12-inch tall letters. Dr. Twenge cites a passage in the book Culture Shock USA, which is a non-satirical guidebook to American culture for foreigners, and I did look it up to check because I’ve seen satirical guidebooks to American culture before that are pretty funny. So the non-satirical guide says “Often one sees an American engaged in a dialogue with a tiny child. “Do you want to go home now?” says the parent. “No,” says an obviously tired, crying child. And so parent and child continue to sit discontentedly in a chilly park. “What is the matter with these people?” says the foreigner to himself, who can see the child is too young to make such decisions.” It’s just part of American culture, the book says: “The child is acquiring both a sense of responsibility for himself and a sense of his own importance.” Dr. Twenge goes on to point out that we ask one-year-olds if they want milk or apple juice, and that as they get older we let them pick their clothes out in the morning and if the kid ends up wearing red polka dots with green and blue stripes then it’s OK because they are “expressing themselves” and learning to make their own choices. Now I have to say that this one hit home for me more than many of the observations in the book, because giving choices is something we have done from a very young age. In fact, an article by Janet Lansbury – who is probably the most well-known advocate of the respectful approach to parenting that we practice has a blog post on setting limits for children which opens “Children need lots of opportunities to be autonomous and to have their choices respected.” Now respect for my daughter is one of the founding principles of my parenting, and I’m not saying I’m going to give it up anytime soon. But it’s not the first time that I’ve noticed that this respectful approach to parenting is very much rooted in the child’s individual growth and development and their rights as people. And strangely enough, it isn’t even a modern American idea – it was brought to the U.S. by a Hungarian immigrant, Magda Gerber, who learned about it from the Hungarian pediatrician Emmi Pikler in the 1940s. I already argued in episode 20 of the podcast, called “How do I get my child to do what I want them to do?” (which, I should note, I titled a bit facetiously), I don’t believe it’s possible to have a child who can both think for themselves AND who will be obedient 100% of the time. But what I want to know is whether it is possible to have a child who can think for themselves and yet who is willing to conform enough to social norms that they are a person that the rest of us want to be around. I don’t have an answer to this question yet, or at least one that’s grounded in science anyway, but I theorize that we’re going to achieve it by walking a somewhat fine line between allowing children to voice their opinions and by actually taking those opinions into account, but by not being afraid to say “no” when it’s appropriate. Back on the topic of children being told they can be anything they want to be, it seems like it’s been a mantra for a while now to tell children that they really can be anything they want to be, when in reality, this is far from the truth. Dr. Twenge cites a whole host of examples, from the band ‘N Sync choosing the song “Believe in Yourself” on Sesame Street to Joey from Dawson’s Creek (which really does date the book a bit) who paints a mural for the high school hallway and says “we could all use a daily reminder that, if you believe in yourself, even when the odds seem stacked against you, anything’s possible.” This goes far beyond pop culture, though – in 2002, 80% of high school sophomores said they expected to graduate from a four year college, compared to 59% just twelve years earlier. In the late 1960s, only 55% of high school seniors thought they would even attend college. 70% of late 1990s high school students expected to work in professional jobs compared to 42% in the late 1960s; unfortunately our society simply doesn’t have a need for this many professionals – we still need people to fix cars and stock the shelves in grocery stores and trim trees. In 2003, 3 out of 4 American college freshmen said they wanted to get an advanced degree (like a Master’s, Ph.D., M.D., or a law degree). So 19% of freshmen want a Ph.D, but only about 4% of people who earn a bachelor’s degree will actually go on to get a Ph.D, so the other four out of five won’t “be all they could be.” The numbers are even worse for doctors, with 12% of freshmen wanting an MD and only 1% of college grads getting an MD – 11 out of 12 don’t make their goal. And teens want to make a lot of money as well – in 1999, teens predicted they would be earning, on average, $75,000 a year by the time they were 30, but the average income of a 30 year-old that year was $27,000. All of this believing in yourself and your abilities represents an extraordinary focus on the self, which is accompanied by an obsession with looks as a channel for making you feel better about yourself. If you don’t like some aspect of yourself you can just Botox it or get surgery to change it – or pierce it or tattoo it to express yourself in a different way. Materialism comes along with it as well – if you’re special, then you deserve special things – like an expensive prom dress and a nice car and a big house. When I watch the show Shark Tank I can’t help but notice the kinds of things the contestants are trying to create; usually widgets that can be made in China for ten cents and sold to Americans to solve a problem the never even knew they had for $29.99; all so the founder (and a Shark) can get rich and “make it” in the world, and buy the nice things they need to help them express their individuality. Are these the problems that the world needs to solve? Really? Working on the real problems in the world is a lot less glamorous and less likely to make you rich, and it is a shame that some people have to choose between being satisfied by what they achieve with their lives and being rich and famous. Parents started telling children they can do anything they want to do so they wouldn’t feel bound by their race or class (even though those things do still have an impact on everything from hiring decisions to whether a start-up can get funding), but telling your child they can do anything they want to do is setting them up for a rude shock when the majority of them don’t go on to achieve the things they are told they can achieve. And when that happens; when they first encounter a failure, they’re much more apt to see the failure as a fault in the system rather than with themselves. When they get anything other than an A grade in school they blame the teacher or the grading system or both, and get their parents to call the school and try to change the grade. But people who believe that outside forces determine their fate are more likely to be depressed and anxious and cope poorly with stress – and Generation Me displays record high levels of anxiety and depression. If you think you think you’re entitled to a lot but you think that the work you do has no relation to the grades you achieve or the promotions you get then you just stop trying – it’s called “learned helplessness,” and I’m sure we’ve all felt it – we’ve all been in a situation where someone has ridiculed our ideas and felt “well, why do I even bother speaking up?” but life is about picking yourself up and dusting yourself off and getting back on that horse. It doesn’t seem to make for a great combination, if we tell children they can do anything but we don’t give them the tools they need to help them overcome the obstacles that will get in their way. 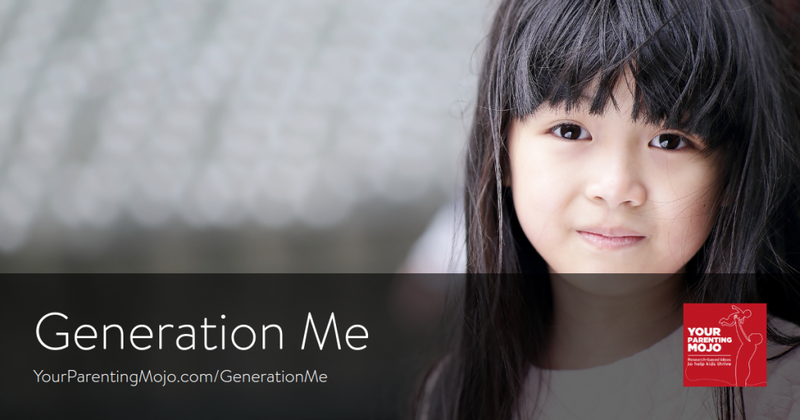 So far in this episode I think I’ve been pretty successful at discussing Generation Me and how it impacts the way we parent as something of an outsider looking in, but there is one area where this topic hits uncomfortably close to home for me. Regular listeners will recall that I actually just launched a course to help parents decide whether homeschooling is right for their family – you can find out more about it at YourHomeschoolingMojo.com if you’re interested. I developed the course after I spent a lot of time researching the right daycare options for my daughter, and then taking the next logical step and realizing that schools are not only not designed to help a student develop to their fullest potential but they’re really bad at it. But when I read Generation Me, I found that one of the defining characteristics of Generation Me is individualism, where we see the self as more important than the community most, if not all, of the time. Dr. Twenge cites a number of examples of this – instead of listening to what everyone else hears on the radio (when you only like half the songs a station plays anyway), we customize a music playlist – or a podcast playlist – and put in our headphones. We don’t watch much network TV anymore; we have whole networks dedicated to special interests and we can stream shows on our devices whenever and wherever we want. There are apparently 19,000 different potential ways to order coffee at Starbuck’s so your drink can be as individual as you are. Companies that make products produce commercials that try to convince us that we can express ourselves by buying whatever it is they’re selling – doubly ironic because they want thousands of other people to express themselves by buying their product as well. Dr. Reich decries the ‘customization’ that is driven by a consumer-based approach to schooling, that is in contradiction with the purpose of schools – he says “schooling, from the time that public schools were founded until today, has served to cultivate democratic citizenship” (Reich 2002, p.59). Dr. Reich argues that the parent’s desire for customized education undermines the basis for democratic citizenship, through the homeschooled child’s absence from school. The lack of logic in his position that homeschooling undermines democratic citizenship makes it virtually impossible to defend. Reich does not seem to have read the same books and papers that I read when I was preparing my course, where I learned that schools in America were designed not to cultivate democratic citizenship but to inculcate the Protestant ethic into students. If we think that schools today are designed to promote then we can say that they fail pretty miserably, because children don’t learn the first thing about how to be a citizen. Did you learn anything in school about how to vote, how to pay taxes, what laws are relevant to a person, how to make sound financial decisions, how to get a job, how to do basic first aid on someone who is in trouble, how cook meals you might actually want to eat, or how to be a parent? And these are exactly the kinds of things that homeschooled children learn by spending time with their parents, living life, on a daily basis. So I reject his idea that homeschooling represents a civic peril because school is the only way that democratic citizenship can be cultivated, but the idea that parents are only giving children educational materials that match up with the parents’ values as a form of customized education was something that seems to fit too closely with the individualization of Generation Me not to explore. But in a way, Dr. Reich is right in that customization is the key to children’s learning, because the two factors that determine whether a child will learn something is that they be firstly developmentally ready to learn it, and secondly motivated to learn it. If one of those two things is missing then the child won’t learn, and this accounts for the reason that teachers in schools have such a hard time teaching students. On the developmental readiness front, different children are ready to learn different things at different times. Some children start reading at age 3; others don’t read until they’re 10 (if they’re left to their own devices) but once they learn, they pick it up so quickly that a few years later there’s essentially no difference in the reading ability of the student who learned early and the one who learned late. But a teacher in a classroom has to teach thirty students, not one, and the most efficient way of transmitting information to students in written format, which is why students who can’t read by the time they get to school are in deep trouble. Children who aren’t in school and can’t read will find plenty of other ways to learn things they’re interested in, until one day they want to learn something that nobody else has time to explain to them and lo and behold, they suddenly find a motivation to learn to read! So how do we fit these ideas together? Well, I’d say that in an ideal world there would be some kind of capability for schools to be more able to adjust the “curriculum” to children’s interests. And that doesn’t necessarily mean you need thirty individual lesson plans for a classroom, but that there’s enough flexibility for the children to decide together what they are interested in and want to learn more about, with some children breaking away to spend time in small groups as needed. And it’s not that when I homeschool I want to control every idea that makes it into my daughter’s brain, but that when she wants to know more about something, I can give her the time and space she needs to explore it, and support her in exploring it. Every toddler is passionate about learning, but that motivation to learn drops off between the preschool and school years as our education system stops them from asking questions and makes only the questions the teacher asks into the important ones. I want my daughter to continue to be the one asking the questions, and in an ideal world a school would support her in that. Schools that support a child in learning whatever they want to learn do exist; they tend to be modeled on the Sudbury Valley School in Massachusetts or a school called Summerhill in England. The students in those schools often don’t have to take classes of any kind; they are pretty much free to do whatever they want and if you were to visit the school you would probably assume you had showed up at recess. But the students actually go on to college at a higher rate than the general population, and go on to have jobs and run successful businesses and earn Ph.Ds, and tend to find that they’re better equipped to do those things than children who went to school because they aren’t burned out from 12 years of being forced to learn things they don’t care about. So yes, it might look like I’m choosing an excessively individualized approach to learning, but that’s more because what I think is an appropriately individualized approach doesn’t happen in schools and can’t happen for as long as schools are focused on the achievement of standardized tests as the measure of a student’s success. There are definitely people who see me as being a bit defeatist, which honestly does make me a bit uncomfortable, and it goes back to what Dr. Twenge says about Generation Me-ers feeling as though they can’t change circumstances in their schools, never mind in the country or the world. I do vote, although Generation Me-ers vote at a lower rate than the generations who went before. We don’t have faith in government or politicians, we don’t believe that war or poverty will ever be eliminated. Social security won’t actually run out of money for as long as people keep working and paying into it, but the reserve fund will be dry by 2034 so benefits will be cut by about a quarter, and in 1997, a survey found that more young people believed in UFOs than in the prospect of receiving a Social Security check when they retired. So you might say “why don’t you try to effect change in our schools?” Well, I’ve watched how long and hard other people have fought to try to change schools. A woman named Vicki Abeles has been working for years just to try to reduce the amount of homework schools assign – she’s actually made a film and written a book about it. She says in the book that “in the years that I have been advocating for change, there have been times when I felt so frustrated that I nearly wanted to throw up my hands, discouraged by the incremental nature and glacial pace of change. Even in the face of a need so urgent – our children sick, disengaged, unprepared, and grieving for their lost hours and thwarted selves – reforms still grind on maddeningly slowly.” And all she’s trying to do is reduce the amount of homework students have to do! When you think about the massive amount of change we would have to undertake to move away from centralized curricula and standardized tests and toward a system that values child-led learning, the task seems pretty much insurmountable. The reknowned developmental psychologist Howard Gardner puts a depressing timeline on it – he says: “I believe that we will not be able to improve our educational system materially in the next decade; fulfilling that assignment will take several decades.” But he said that in 1991, so it has already been almost three decades since Gardner wrote these words and I would argue that we remain far from any such improved system and that, in reality, we’re moving in the wrong direction. Yes, it is a very “Generation Me” trait to say “you know what? I don’t believe that my participation in this system is making it any better for any of the other participants and I believe that by declining to participate in it my daughter will have an immeasurably better experience.” Dr. Reich argues that by depriving the school system of a well-educated parent who cares about her daughter’s experience, the school system suffers; the remaining children whose parents aren’t or can’t be as invested in *their* experience suffer. And it’s possible, I suppose, that in some tiny way that’s true. But there are so many well-educated parents participating in the school system and yet it still is where it is, and I really don’t believe that anything is going to shift within it based on my participation or withdrawal. But I’m not just withdrawing from the school system; I’m moving toward other things. I’m moving toward creating communities of people who care passionately about learning and about supporting their children in developing a love of learning, and I hope that at some point soon we will get to some kind of critical mass of people doing this so learning in this way isn’t seen as “weird” in any way and becomes something that parents routinely consider as one of their options for supporting their child’s learning. So to bring all this full circle, I should say that is another one of those episodes that didn’t really end up where I expected it to – it seems like we do those a lot around here. And I also want to be clear that I’m not going to be harping on about homeschooling in every episode from here to eternity; in fact, I wasn’t even intending to do that here. But I did just actually launch my course to help parents decide whether homeschooling might be right for their family, so if you’d like to check it out you can do that at yourHOMESCHOOLINGmojo.com. I’m recruiting pilot testers right now so you can go to yourhomeschoolingmojo.com and click ‘sign up’ and enter coupon code PILOT50OFF for a 50% discount on the full price, so the cost to you is $99 instead of $199 if you’re one of the first TEN people to sign up, because there are only ten of those coupon codes available. In exchange for that substantial discount, I’d be grateful if you’d be willing to offer feedback at the end of the course on what I could do better, as well as a testimonial for how it helped you. If you’re not interested in being a pilot tester but would just like to take the course, then you can either do that now at full price if you’d like, or you can just drop by the website in a couple of weeks once the pilot testers have been through and helped me to make it better then you can do that too. And I don’t have any neat answers at the end of this episode like I usually try to because honestly I’m still trying to figure out for myself what is the balance of letting my daughter make choices for herself and me “being the parent” and making decisions that need to be made for her. I do want her to feel as though she has control over her own life, but at the same time I want to be sure she doesn’t think she’s the queen of the house and that her needs must be met before anyone else’s. The tool I try to use here is one I learned from Janet Lansbury, the ambassador for respectful parenting, who says that you know you need to set a limit when you feel yourself getting irritated about something, and I do find myself getting irritated when she is very demanding or wants to climb all over me all the time. And I also set a limit when there’s a clear reason for the limit, like she’s helping me in the kitchen and she reaches for a sharp knife. Both of those two indicators – me feeling irritated and there being a clear reason for it – mean that I set limits when I know I can hold them, which means I don’t waver. And not wavering on a limit means that my daughter doesn’t really try and test limits too much – she knows that when I say she shouldn’t do something then I’m not going to change my mind. It also means that my default position is to allow her to make decisions for herself – last night she found our cocktail muddler and wanted to know what it was for, and then decided to go and get some mint from the garden to make her own muddled mint water, and I said “sure – why not?” I let her roll around in mud puddles and touch insects and pretty much do what she wants as long as it doesn’t irritate me or pose a safety threat. And, for the moment at least, I find these criteria strike something close to what seems to be the right line between allowing my daughter to make a lot of choices for herself without giving her the impression that she rules the roost. If you draw your line in a different place, I’d love to hear from you – I’m definitely figuring this one out as I go. Thanks for listening – if you’d like to see the references for today’s episode you can find them at yourparentingmojo.com/generationme (with “generation” and “me” run together).